Antibiotics are a group of medicines that are used to treat infections caused by bacteria and certain parasites, and they are among the most commonly prescribed medications in the US. Antibiotics are used to kill bacteria and they don’t differentiate between good or bed bacteria. As a result, every time you swallow antibiotics, you kill the beneficial bacteria within your intestines. Good bacteria in the gut help people in many ways, including helping make vitamins and boosting immunity. Some researchers think that killing them off with antibiotics may be contributing to an increase in chronic health conditions such as obesity, asthma and cancer. (1, 2, 3). If you do need to take antibiotics you should also take probiotics which will help to restore the good bacteria in your gut. Nature has several other highly effective substances with antibacterial, antifungal and antiviral properties, all able to protect the human body safely and with deep healing powers. Here are 13 natural antibiotics still in use around the world. I would like to note that this article is not intended to replace medicine, a doctor’s care or medical treatment. Goldenseal is used by many people as a homemade antibiotic. Goldenseal is easily grown in the United States and has become a popular natural method of killing bacteria. There are several forms of Goldenseal including pills, extracted liquid and glycerites. The most popular method of ingestion is mixing liquid extract to wash over your skin since it doesn’t absorb effectively when taken orally. Ask your doctor before taking goldenseal if you’re currently on any other type of medication. It may cause irritation of the skin and increase it’s sensitivity to sunlight in some users. Avoid using it if you have high blood pressure. Use – People tend to use this supplement in tincture or tea form. The root can be chopped into hot water and actually tastes pretty good thanks to the alkaloids. The dried root shouldn’t be exposed to much light or heat and should be thrown away after a year of storage. Some people experience nausea after the first few doses. The best bet for this supplement is to search for capsules and tablets containing no less than 20% andrographolide. Look at the recommended dosage on the label. Don’t use the product for longer than three months. If you experience diarrhea, upset stomach, or a headache stop taking it immediately. Some people call Manuka honey a natural penicillin because it’s naturally antiseptic. Use – You can apply Manuka honey directly to a wound or burn for optimal results. Further reading: The 10 most amazing Manuka honey health benefits and uses. Manuka honey may elevate blood sugar or cause an allergic reaction. It also interacts negatively with chemotherapy medication. Tea tree oil is extracted from the Melaleuca Alternifolia tree is now becoming a widely-used natural health remedy thanks to its versatility. The most recurrent use is treating cuts, acne, toenail fungus and infections. Studies have shown that tea tree oil is antibacterial and it works effectively in both infection preventing and healing bacterial issues. (13). If you are interested to learn more about essential oils you can find useful information in my e-book Magical Aromatherapy. This book will help you to discover the power of essential oils and the most effective ways to use them. Test the oil on a small area of your skin to check for allergies prior to use. Use – The most popular way to use garlic is by adding it to your dishes, eating it raw or in powdered form. There are also garlic oils, extracts, and freeze-dried tablets. Find more information in my articles how to use garlic as a medicine and avoid these 6 common mistakes when using garlic as an antibiotic. Some people who take too much garlic may experience a burning sensation in the mouth or stomach, heartburn, gas, nausea, vomiting, body odor and diarrhea. These side effects are often worse with raw garlic. Also garlic might prolong bleeding, so stop taking garlic at least two weeks before a scheduled surgery. It can also interfere with certain medications. Native Americans have used echinacea as a way to fight off infections and treat injuries for over 400 years. Medical studies have confirmed that echinacea is an effective alternative to antibiotics. Use – Echinacea is available in tinctures, pills, extracts, and ointments. It’s commonly found in capsules and tablets mixed in with other natural health supplements. The root, leaves and flowers can also be steeped into hot tea. See here the recipe for echinacea tea to boost your immune system. Some supplement companies use misleading labels with products that contain very little echinacea so read carefully the product label. Avoid taking if you have diabetes, HIV, liver troubles or multiple sclerosis. Echinacea can also cause a rare allergic reaction in some people. This supplement is extracted from the wood and bark of the Pau D’Arco tree. Evidence suggests that Pau D’Arco can help treat intestinal worms, ulcers, yeast infection, and sexually transmitted diseases (STDs). The main chemical extracted from the tree for medical purposes is called lapachol. Pau d’arco is sold as tablets, dried bark tea and tincture. The chemicals that give pau d’arco its medicinal effects don’t dissolve well in water, so a tea is not recommended. Exercise extra caution when using this natural antibiotic. High doses can result in serious diarrhea, nausea and internal bleeding. It interferes with medications that slow blood clotting, so talk to your physician before using a Pau D’Arco product. Ginger is considered an effective way to ward off nausea caused by motion sickness or pregnancy. The phenol compounds like shogaols and gingerols are the main medicinal component in the root that contribute to the anti-inflammatory benefits, as well as lowering cholesterol. (32, 33, 34, 35, 36). Use – Ginger is best known for its use as a spice in the kitchen. You can also find ginger extracts, tinctures, capsules and essential oil. A popular method is brewing hot ginger tea, and you can find in my previous article how to make anti-inflammatory and pain relief ginger turmeric tea. 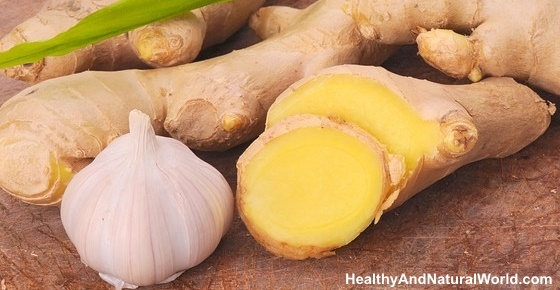 You can also find more information in my previous article on how to use ginger as a medicine. Adding ginger to your diet is also one of the 70 habits featured in my e-book 70 Powerful Habits For A Great Health which will guide you how to take positive steps to improve your wellness and overall health. Pregnant women should consult with a doctor before taking a concentrated amount of ginger as in ginger supplement (ginger is considered safe when used in amounts found in food), and ginger should not be given to children under 2 years old. Ginger may also interact with certain prescription medications. For example it may not be safe if you have a bleeding disorder or take blood-thinning drugs. Therefore talk with your doctor before taking it. Further reading: Ginger Should Be Avoided By These People. The polyphenol called oleuropein and fatty acids found in the plant are the main components in medical use. Find more information in my article about the health benefits of olive leaf including how to make your own olive leaf tea. Use – Olive leaf extract is most effective as a pill, topical cream, and liquid extract. It can be applied directly to the skin or consumed with a suggested maximum dose of 60g per day. Use – Oregano oil can be mixed with hand sanitizer, vaporized into the air, rubbed onto the skin, or taken in pill form. 600 mg a day is sufficient for stomach parasites. Oregano is relatively harmless when found in recipes for cooking. In medical amounts it can cause upset stomach if too much is taken and can interfere with medications containing lithium. Also pregnant women should avoid taking it. There’s also potential for allergic reactions. Use – Turmeric root can be consumed raw but is most commonly dried and powdered. The powder can either be ingested in a drink, sprinkled onto food, or simply found in a capsule. There are also tinctures dissolved in alcohol and liquid extracts of turmeric. Find more information in the article about the health benefits of turmeric, including a recipe for a golden milk. Turmeric is considered a generally safe herb but when used too much it can cause an upset stomach and even ulcers. If you have surgery scheduled within two weeks turmeric should be avoided because of the blood thinning properties. Also taking turmeric by mouth in medicinal amounts is likely unsafe in pregnancy. Further reading: Turmeric Should Be Avoided By These People. Find more information in the article about the many health benefits of coconut oil. Use – Coconut oil can be added to smoothies, hot drinks, stir fries, baked goods or as a spread on a toast. Always opt for organic, virgin coconut oil and avoid all the refined stuff. Coconut oil is safe for most people if used in amounts commonly found in foods, and despite the many health benefits of coconut oil, like many things in life, moderation is the key. This means that up to 3 tbsp. daily per adult is an appropriate dose. Mother Nature gives us great natural alternative to antibiotics – next time the you feel unwell try these natural alternatives to antibiotics. if you are pregnant or breastfeeding please consult with your doctor before using any of these herbal antibiotics. Hi Marcie, there are various of herbs with antibiotic properties that you can apply to the skin, such as coconut oil, Manuka honey or diluted tea tree oil in a carrier oil. Apply it on the skin and cover with a bandage. If you see that the situation does not improve or becomes worse, go to see your doctor, as you may need something stronger. Hey I had the same problem steriod creams and tablets don’t help. Finally I asked a tribal what they use and she suggested neem. If you can buy neem oil from a natural health care store it will sort you out in a week. Though I must warn you that you might lose the purple colour. Ginger and turmeric are from the same family so I would talk to a doctor about this issue. Foods in the same Family share a similar molecule structure inside and can cause you to react to several or all foods in that family (although it doesn’t have to – it’s not black or white). Same goes for cashews and pistachios – why taking any risk? it’s best to be on the safe side and see what your doctor says. As for garlic and fibroids – I haven’t seen references that garlic can worsen fibroids. Do you have any suggestions on what to do about severe allergy problems with sinuses? I wake up in the morning with my head feeling very stuffed up, and our Dr. Seems to be unable to give me anything that helps my situation. I am currently taking antibiotics prescribed to me by my doctor. I really don’t want to take it and I’d prefer something organic/natural. My question is can I skip the antibiotics and just take echinacea or should i call my doctor first? There are cases when antibiotics is really needed, for example when the infection is substantial. You always have to consult with your doctor first regarding your specific condition, and follow his/her advice. Don’t do self diagnosis. Plant Nasturtiums and when the flowers die ( after the bees have been pollinating ) you are left with a triple green seed from eachflower about the size of three petit pois. Nip three triple heads off the plant and chew them to a pulp and swallow , with a drop of water if you don’t like the spicyness. Repeat again at night and do this for 3 to 6 days. Nasturtium seeds are Antibiotic and neither you nor the bugs can build up a resistance to them! All down to the involvement of bees. If you want to know more just search the web for Nasturtiom Antibiotic and you will be gobsmacked. You can also nip the seed heads off the plant and freeze them for use in Winter and they are just as good. I used to always be at the Docs for antibiotics but I haven’t seen him since for the past 10 years cos I growmy own as do dozens of my friends. By the way in 2003 I nearly died on the test bench in. Hospital, now I’m nearly 72 and fitter than I ever was in mid life.